Governments and citizens can take Action for Community Economies every day. To strengthen community economies, small steps can make a big difference. Imagine – using everyday spending to make lasting social change. It’s simple: spending on the goods and services we all need can also create positive social and environmental outcomes. Many Canadians already do it, and so can our government. Community enterprises operated by nonprofits, co-operatives and micro-enterprises established by or dedicated to supporting disadvantaged individuals play an important role in wealth creation and in responding to the needs of rural and urban communities. 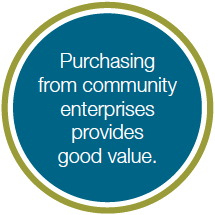 Choosing community enterprises for our everyday spending can get our communities more bang for our buck. 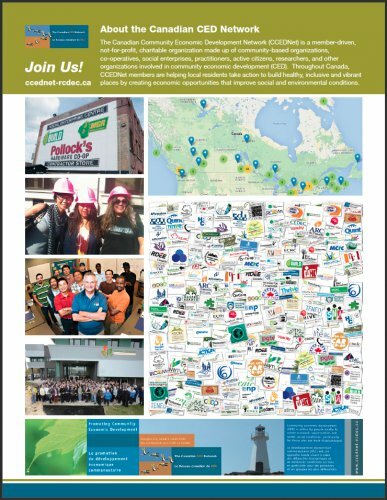 Across Canada, governments are seeing the lasting return on investment created by purchasing from community enterprises. All governments can reinforce their existing spending for social change by purchasing through community enterprises. We expect our investments to provide a financial return. What if they could provide benefits to our communities as well? Investments in community enterprises generate both financial and social returns. More and more people are investing in their community’s future, whether in local enterprises, community assets or social investment funds. Governments can provide tools to support and stimulate this movement of people taking charge of their communities. Innovations such as tax credits for community investment or support for the replication of successful community investment funds are measures that governments should adopt. Small changes in the way we spend and invest add up to big changes in community economies. These policy changes can create a powerful supportive environment for community economies to thrive. Encourage your municipal, provincial and federal representatives to take action now. Click on the links below to Share! 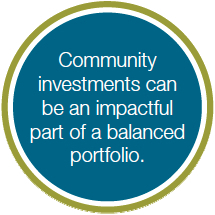 Find examples of community spending and investing initiatives, and add your own.